Opening the battle for second-round votes, Le Pen told France 2 television she was temporarily stepping down from day-to-day management of the National Front (FN) to focus on her campaign. She also said she wanted to talk to sovereignist Nicolas Dupont-Aignan, who won nearly five percent of the first-round vote and has not said which side he would take in the next. "His platform is extremely close to ours. Patriots should come together to fight those who promote unbridled globalisation," she said. ReutersThe campaign of Emmanuel Macron, the favorite to win France's presidential election, has been targeted by a cyber espionage group linked by some experts to the Russian military intelligence agency GRU. Reuters UKFrance's outgoing president, Francois Hollande, on Monday urged people to back centrist Emmanuel Macron in a vote to choose his successor next month and reject far-right leader Marine Le Pen, whose place in the run-off represented a "risk" for France. 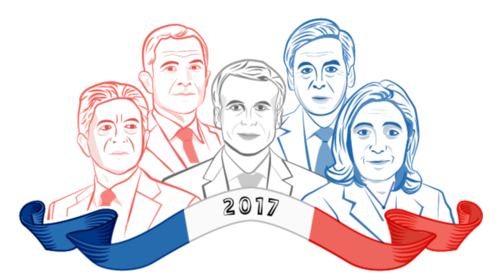 Reuters UKFor investors and pundits it is the big question-mark hanging over Emmanuel Macron; the 39-year-old centrist looks certain to win a runoff for the French presidency, but how can his one-year-old upstart party win the parliamentary majority six weeks later that he needs to implement his programme? Reuters UKThe chairman of French gas and power group Engie said on Monday that centrist Emmanuel Macron's passage into the second round of France's presidential elections brought "hope for a rebound of Europe". Reuters UKThe Italian and Greek governments are counting on France's likely next president Emmanuel Macron to help them see off populist parties that blame European Union-enforced austerity and open immigration policies for economic and social ills. 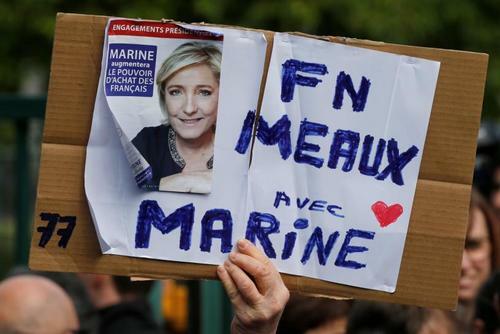 French far-right veteran Jean-Marie Le Pen said on Tuesday his daughter Marine, who faces centrist Emmanuel Macron in a May 7 presidential runoff, should have campaigned more aggressively for Sunday's first round, following the example of Donald Trump. 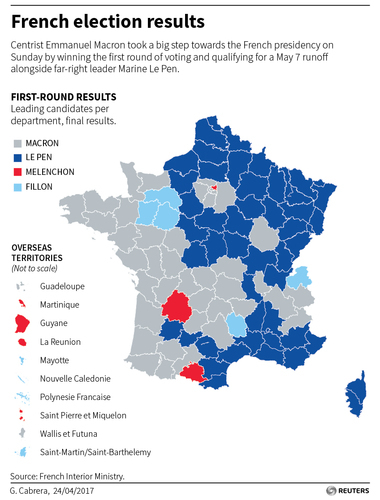 ReutersPollsters picked the twocandidates to make it into next month's French presidentialelection run-off, going some way to restoring their reputationin financial markets before other important votes across Europe. 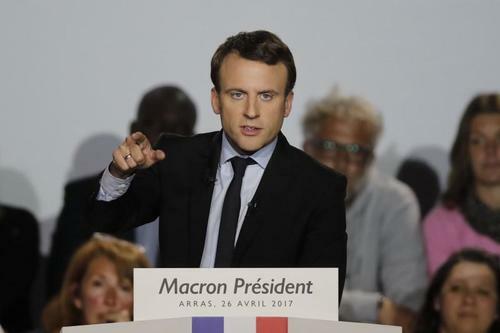 France's Macron says election is not won yet, will fight to the end to defeat far-right's Le Pen. Reuters UKJean-Luc Melenchon, the far left candidate who came fourth in the first round of France's presidential election with nearly 20 percent of the vote, is polling core supporters on whether they will back centrist Emmanuel Macron in the second round. Reuters UKFrance's two presidential candidates traded barbs on Tuesday with centrist Emmanuel Macron accusing far-right rival Marine Le Pen of promoting hatred, while she labelled him as the "candidate of the oligarchy." 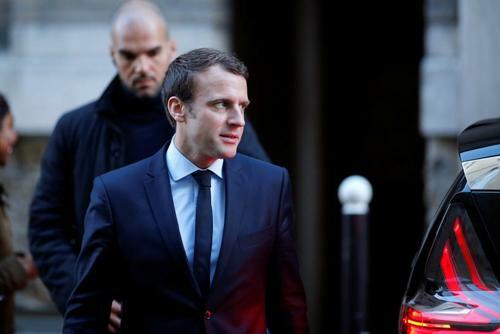 Reuters UKFrench presidential favourite Emmanuel Macron came under fire from both potential allies and his run-off rival Marine Le Pen on Tuesday for acting as if victory next month was already in the bag. 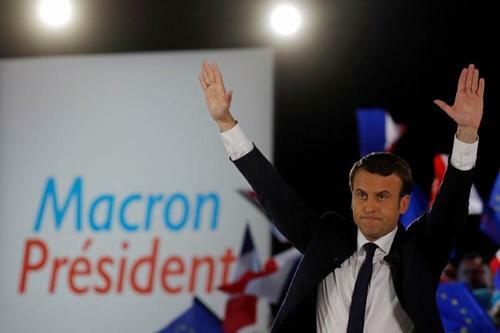 Reuters UKFrance's centre-right party, seeking to rebound after the defeat of its presidential candidate, said on Wednesday it could share power with Emmanuel Macron if he is elected, as pollsters predict, on May 7. Reuters UKFar-right leader Marine Le Pen sought to steal presidential rival Emmanuel Macron's thunder on Wednesday with a surprise visit to striking workers in northern France, aiming to wrong-foot him while he was campaigning in the same town. 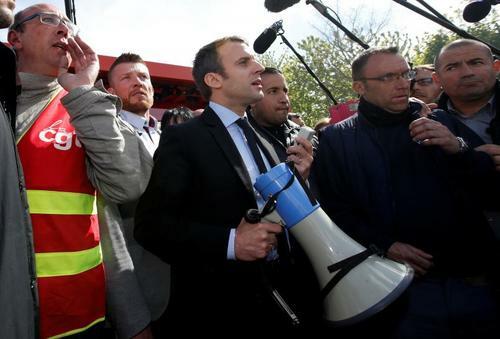 Reuters UKStriking workers jeered France's front-running presidential candidate Emmanuel Macron on Wednesday when he showed up at a northern French factory after being publicly trumped by far-right rival Marine Le Pen. Reuters UKFar-right leader Marine Le Pen has made a more impressive start than favourite Emmanuel Macron to the last lap of the French presidential election, a poll showed on Thursday. 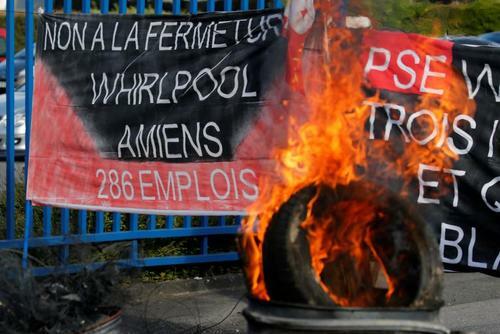 Reuters UKMarine Le Pen set a public relations trap for rival presidential candidate Emmanuel Macron on Wednesday when she showed up among striking French workers at a closing factory the day he was meeting their union representatives a few miles away. ReutersControversy over her party's record on the fate of Jews in World War Two returned to haunt French National Front presidential candidate Marine Le Pen on Friday as the man due to replace her temporarily as party leader suddenly stood aside. 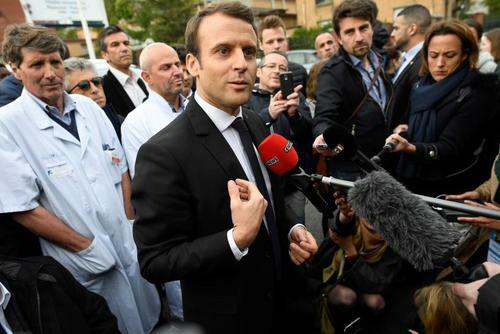 Reuters UKA new Odoxa survey of voter intentions said centrist Emmanuel Macron would win the French presidency in a May 7 vote, but that his share of the vote would be 59 percent, down four percentage points from its previous survey. 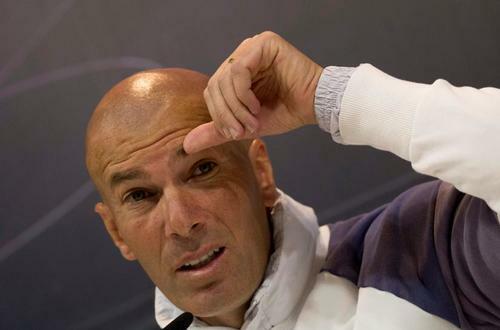 Reuters UKFrench soccer legend Zinedine Zidane on Friday warned against voting for Marine Le Pen's National Front in the run-off in France's presidential election on May 7, repeating his 2002 stand against the far-right party. Holocaust controversy haunts Le Pen campaign. 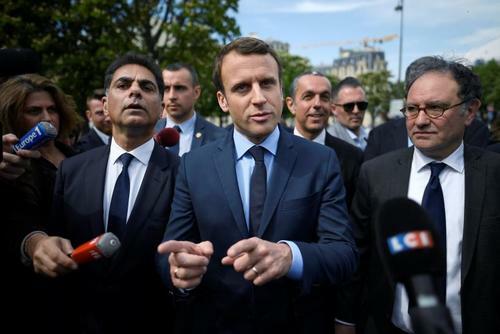 ReutersCentrist presidential frontrunner Emmanuel Macron and his far-right rival Marine Le Pen traded campaign blows across Paris on May Day, as France's most crucial election in decades entered its final week. 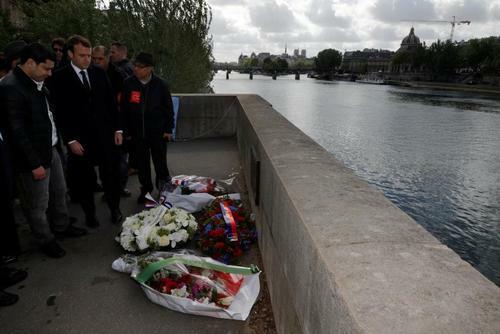 ReutersFrench presidential frontrunner Emmanuel Macron on Monday paid homage to a young Moroccan man who drowned in the Seine 22 years ago after being pushed into the river by skinheads on the fringes of the National Front's traditional May Day rally. Macron and Le Pen exchange May Day blows. Aides of French far-right presidential candidate Marine Le Pen on Tuesday brushed off criticism of her use of phrases lifted straight from a speech by conservative rival Francois Fillon in her May Day address to supporters. Le Pen acccused of lifting parts of rival's speech. 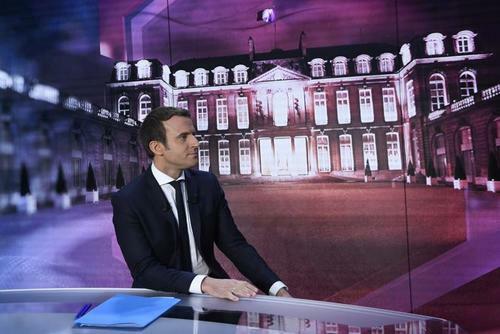 ReutersFrench presidential candidate Emmanuel Macron said if elected he would push the European Union to raise anti-dumping taxes as part of an initiative to soften the impact of globalization. Reuters UKAbout a third of members of far-left politician Jean-Luc Melenchon's political movement will cast their second round French presidential election vote for centrist Emmanuel Macron, results showed, with the remainder planning to cast a blank vote or abstain. Generation Macron: Young liberal EU leaders rally behind French "Kennedy"
Reuters UKIf Emmanuel Macron wins Sunday's French presidential run-off, Europe's pro-EU liberals will finally have their champion. ReutersFar-right presidential challenger Marine Le Pen refused to rule out capital controls if she won the election and there was a run on banks as she negotiated France's exit from the European Union, but stressed they were unlikely to be needed. Ahead of Sunday's decisive second round, Le Pen reaffirmed she wanted to take France out of the euro and said she hoped the French people would have a national currency in their pockets within two years. The objective is to transform the euro 'single currency' into a euro 'common currency', going back to the ancestor of the euro, the ECU, which was an accounting unit that did not stop each country from having each its own currency." I am convinced there won't be any banking crisis." If there's a run on banks, we could very well imagine such a solution for a few days, but I'm telling you it won't happen." 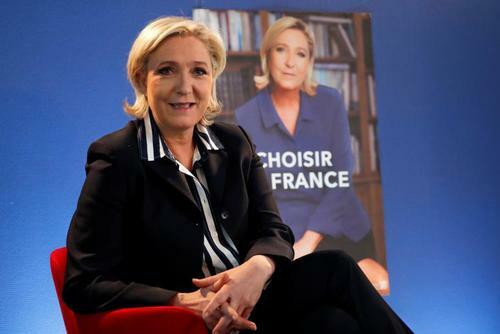 Far-right presidential candidate Marine Le Pen said on Tuesday she was better placed than her rival, centrist Emmanuel Macron, to defend France's interests in what she called the "new world" of U.S. President Donald Trump and Russia's Vladimir Putin. If Emmanuel Macron wins Sunday's French presidential run-off, Europe's pro-EU liberals will finally have their champion.